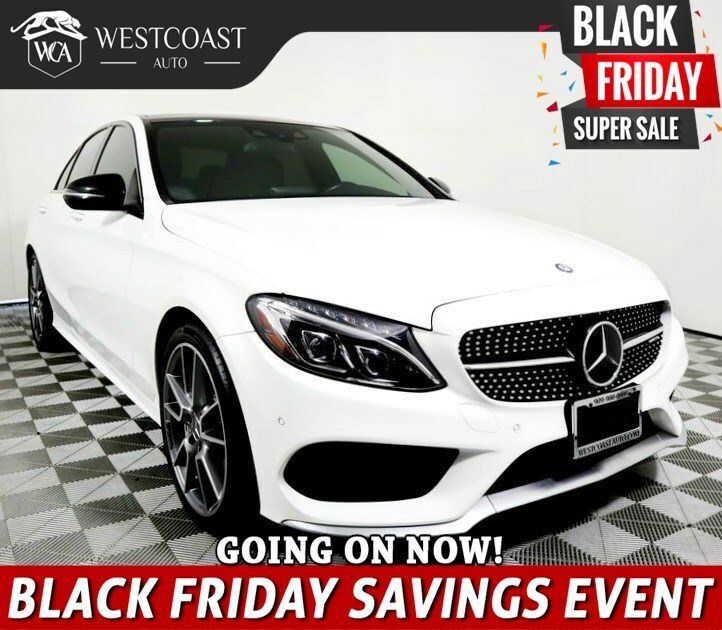 Built to exceed your expectations, our One Owner, Clean CarFax 2017 Mercedes-Benz AMG C43 is sculpted to perfection in designo Diamond White Metallic over Black interior! The 362hp 3.0 Liter Biturbo V6 is perfectly matched with a 9 Speed Automatic with AMG Dynamic Select. Our All Wheel Drive soars to 60mph in just 4.6 seconds and delivers brilliant driving dynamics! Our AMG C43 is prestigious, poised, and powerful as it commands attention whether cruising down the street or parked in your driveway with its aggressive styling and beautiful alloy wheels. Masterfully crafted down to the last detail, the cabin greets you with brushed aluminum pedals, red seat belts, an AMG menu with Racetimer, and even remote start via mbrace Mobile App. You'll appreciate dual-zone automatic climate control, heated front seats, premium audio with FrontBass, Bluetooth, HD radio, SD card reader, and other top-shelf amenities. Did you see the navigation and sunroof? Our award-winning sedan puts an emphasis on safety with state-of-the-art systems such as Collision Prevention Assist Plus, Blind Spot Assist, Crosswind Assist and a rear view camera. You desire automotive excellence and our C43 AMG delivers! Print this page and call us Now... We Know You Will Enjoy Your Test Drive Towards Ownership! Great quality, easy financing and affordable prices aren't the only things that make Westcoast Auto Sales the first choice of many discerning auto buyers. Stop in and See California's Dealer of the Year!